If you walk around some areas of any progressive inner-city area you ought to come across a building or public space with a green exterior. This love of living systems exemplifies how green facades are more than just a pretty face. Green facades often take the form of flora-based walls and roofs and are a type of finish that can be applied to a building or structure. They also help reduce visual pollution, including graffiti, sign clutter, and undesirable reflectivity. As well, they can improve the visual quality internally as well as help to diffuse light and prevent glare. 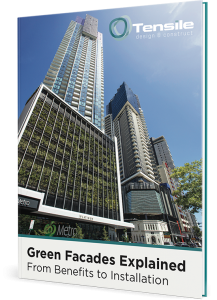 Green facades are also considered by many experts in urban design to benefit local amenity and assist in improving the physical environmental conditions in and around buildings – hence not just a pretty face. Research has shown that spaces that are surrounded by plant life in the urban context are valued greatly by workers and residents. The broadly green exteriors enhance urban areas and supplement public open space particularly if experienced from the public domain. The flora can be selected to improve such elements as the air quality, physical beauty, and provision of biodiversity. The fixture to structural support ensures that the flora, growing medium and other components are protected, safe, positioned correctly and hence achieve desired outcomes of the green facade. The fixture(s) may take many forms and may include adhesive, frame mounted, bolted or tensile wire attachments. Research has also found that the increased marketability of properties with green facades supports the idea of higher rents and re-sale values and levels of occupancy as another key economic consideration. Green facades have the ability to provide more than just environmental benefits but also economic and social benefits. As green facades began to grow in popularity, the term bio philia was created to show how they were linked to nature especially as research found that having a safer, cleaner environment allows people to work longer and more efficiently. In the broader context, the technical benefits of these built form treatments assist in tropical and temperate climates particularly with regard to addressing the heat island effect. The potential for green facades to improve the microclimate, including reducing the heat island effect (temperatures in cities going up because of a lack of trees), is widely recognised by increasing the amount of plant life into the environment – another reason why a love of living systems shows how green facades are more than just a pretty face. To find out more about living systems and green façades check out some of our projects here.